What is the difference between timber framing and post and beam construction? Timber framing is the building of post and beam structures. 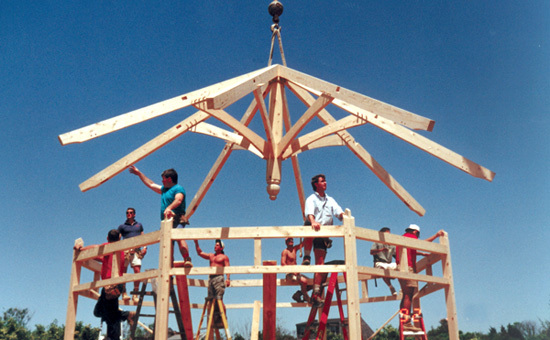 Over the years, as this age-old craft has been revitalized by experts like South County Post & Beam, it has become more widely known as timber framing. In this elegant process, timbers are connected by pegged mortise and tenon joinery, with the wood beautifully exposed. Dynamic timber exposure on the exterior can also enhance the function & appearance. Some exterior elements to consider might be entries, pergolas, gazebos, arbors, porches and decks. What services does South County Post & Beam provide? Timber frame construction complements every architectural style of home. With over 35 years of experience we've become well-versed in a variety of design types and can provide a custom frame to meet any individual's taste. Please visit our gallery. Do you have stock plans or is each home an original? The majority of our projects are custom designed in conjunction with the homeowner giving them intricate roles in the design of their dream homes. As a lower cost alternative to custom design, we offer our expanding line of Timber Frame Signature Homes. 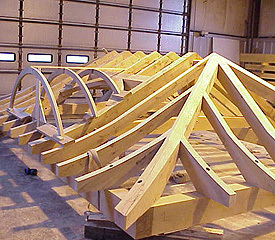 These are our own stock designs, which offer great timber frame homes at a more economical price. Can we talk to other SCPB home owners? Yes. We will be happy to introduce you to other SCPB home owners, so that you can discuss their home-building experience with them. We can also supply testimonial letters. Visiting a SCPB timber frame structure will allow you to see the wood frame in all its beauty. What distinguishes SCPB Company from other timber frame companies? SCPB offers a full design/build service and has the timber frame expertise to partner with architects and designers of conventionally framed structures to help them complete their designs. Our design and production facilities are in one location. This is important to achieve the communication necessary between the design, project management and timber fabrication of a timber frame home. We combine state of the art technology from our CNC machine with the hand crafted details that create curved beams, curved braces, natural debarked logs with inset joinery, and technical joinery details. A SCPB crew raises nearly all of our frames. We find great benefits in having the same crew that cuts the frame, raise the frame, rather then simply hand off the frame to others to complete. We can ship our timber frame homes anywhere you want them delivered! 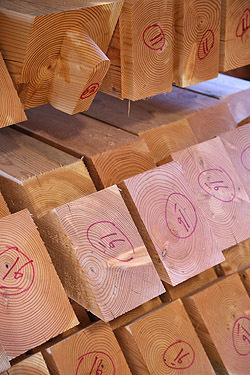 What species of timbers are used in your homes? There are a variety of wood types available including Douglas Fir, White Oak, Red Oak, Cypress, and White Pine. Other options include Western Red Cedar, Port Orford Cedar, and recycled timbers. Yes you can. Our pre-cut timber frame packages are very popular with home owner contractors. We can facilitate the process for you, if necessary. Your decision to assemble the building yourself may be to reduce costs. If so, please consider whether you have the time, skills, patience, and if the savings make a significant difference. Most of all, will you enjoy the project, or would it be more fun to watch professionals raise your special structure? The flexibility of the insulated panel system allows us to easily achieve whichever R-value you require or feel is most appropriate for your building situation. Most of our customers stay with our standard insulation system, which is an R-15 wall and an R-30 roof. When codes require higher R-values, we can achieve them easily, up to R-60. Who will raise our SCPB package? Over 90% of our timber frames are raised by an SCPB crew. The benefit of having the same person cut your frame and raise your frame is invaluable. While cutting, the timber framer becomes intimately familiar with your frame and knows precisely how the timbers come together, making for an efficient and beautiful raising. How much does a SCPB home cost? The typical SCPB timber frame and insulated panel package averages $45 - $65 per square foot. Completed construction cost (excluding land, septic, permits, driveways, landscaping, etc.) average an additional $150-$200 per square foot. A SCPB home will compare in cost to a well built, conventionally framed, custom home in the same area. Costs do vary greatly with site conditions, availability and cost of skilled labor, as well as the size and complexity of the structure. The final cost is greatly influenced by the selection of finishes and esthetic details. No, though we may easily recommend a few premier lenders we have worked with in the past, who have provided financing for past clients of ours. A hybrid combines multiple building systems, such as timber frame components and structurally insulated panels. This is a common practice due to design considerations. For example, the common areas like the foyer, great room, dining and kitchen areas may be preferred if timber framed, showing off its beauty, whereas the bedroom areas may be built with structurally insulated panels. Yes. We embrace the opportunity to grow your existing house. Whether it's a truss system or an expansive great room, Timber Frame Additions can make a spectacular statement to any home design. We can ship our packages anywhere within the continental United States and abroad. Once on site, our frame and panel packages are assembled by a SCPB crew. Though 90% of our frames are assembled by a SCPB crew, occasionally, a homeowner or a local builder, utilizing our plans and detailed instructions, performs the assembly. Give us a call, write us an email, send us a fax, use the Contact Us Page, or schedule a visit to discuss your building project with us in detail. You may just have some questions that we have not yet answered or have a set of plans and are ready for us to cut your frame. Let us help you explore your options no matter which phase you are in. We look forward to hearing from you and exploring your dream.